Ocean Breeze East, the affordable condo directly on the gulf, is perfect for those who enjoy small complexes. The building has 31 units with a Gulf front swimming pool and a large sun deck. 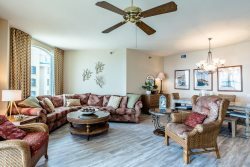 This condo has 1338 SF of living area and Gulf Front balcony access from the Living Room. Electronics include 42" Wall-Mounted TV, DVD in Living Room, 32" LED TV in Master Bedroom, 32" TV in Guest Bedroom 1 and 24" TV in Guest Bedroom 2. Free seasonal beach service included. We have been using Perdido Key Realty for years we always get great service and we would not use anyone else. The staff is always helpful and kind. The property we stayed in was large and the view was magnificent. We will chose this same property again for our yearly visits and soon to be Bi-yearly visits and more. This is a great property close to beach and other locations such as stores and dining. The beds were so comfy. I have been coming to Perdido Key for years. We have only used Perdido Reality they are so professional and friendly. I would'nt use anyone else. They have always gone above and beyond in their customer service. The most beautiful view in Perdido Key! We love 804! It's modern beautiful clean comfortable well equipped and the beds are great! This is our favorite. Last year we got a fly by from the entire Blue Angel Team so close we could see the pilots and it was amazing! Coming back yearly and 804 is for us as it is the best!